Are you starting 2019 by wanting to update your bedroom’s decor? If so, starting with this Elizabeth Krueger beauty, these grey bedroom ideas will add fuel to your roaring, winter fire. Grey bedroom inspiration comes in many forms. It encompasses grey bedroom furniture, grey bedroom accessories and even grey bedding ideas. The only questions to ask are how big do you want your grey statement to be? And how many shades of grey to reference in a single scheme? A grey-themed bedroom doesn’t have to be confined to grey-hued carpets, window treatments and wall coverings. 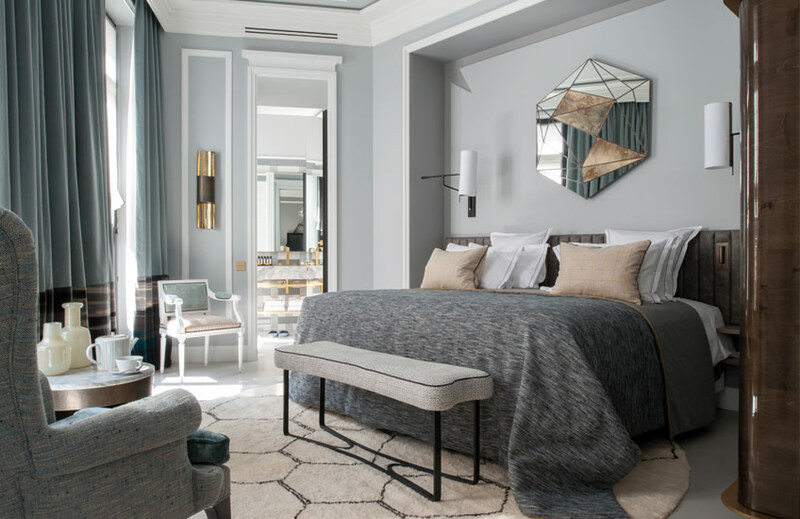 Let your furniture be involved in your colour palette by considering an upholstered bed in a grey fabric such as silvery grey velvets or dove grey cotton. Or even just a headboard to update an existing bed frame or divan will have instant impact on defining a bedroom’s grey colour scheme. If you have an existing fabric headboard, you can look at having it reupholstered in a new grey-toned textile. Go beyond the bed and look at other furniture in your bedroom. Some form of upholstery in the bedroom is a real must to soften your scheme, so look for a grey dressing table chair or an armchair if you have space to spare. 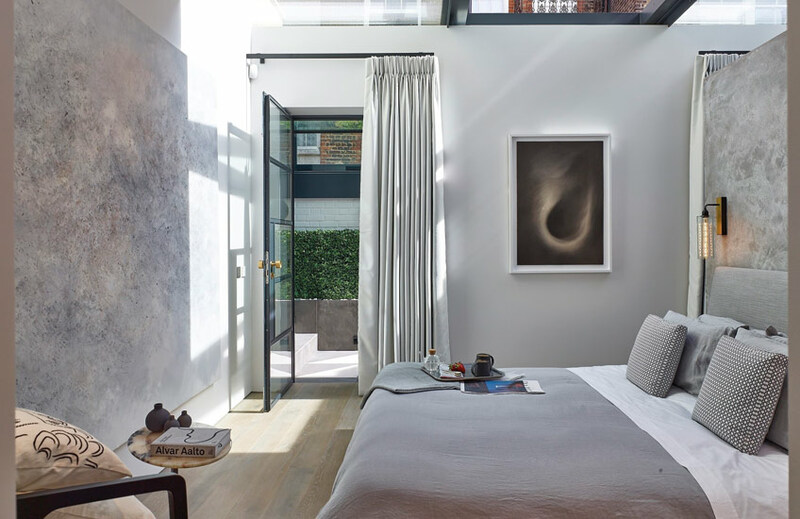 Grey bedroom designs include wardrobes painted in grey or with a grey wood finish, like a wood stain or pale wash. Or bedside tables with a mirrored finish, which, while not grey, they have a cool tone and will reflect other grey elements in the room, taking on the colour themselves. Grey bedroom decor takes in overlooked parts of the room too, such as bed linen. It’s wise to choose a contrasting shade of grey on your bed to the colour which is on the walls – otherwise it’s quite a large masse of the same tone and can make your room feel flat. For example, if you have a nearly-black shade of grey on the walls, pick pale grey or crisp grey and white bedding. If you prefer the look of classic Egyptian cotton bedding in white, look out for designs that have piping in grey, or a line of embroidery in grey that you can then pick up on with pillows on the bed and a blanket at the foot of it. Accessories are the area of your grey bedroom designs that are the most varied. This means you can weave in all sorts of objets and decorative accents that you’ll have a lot of fun amassing. A favourite of interior stylists is to use a few trays as objects of beauty in their own right, but also to create design-led divisions in your bedroom for curating small displays. Mix up the textures of these by having a grey suede trinket tray on your dressing table, a silver one on your nightstand for jewellery and a luxurious breakfast-in-bed tray in pearl-grey shells or mercerised glass. On other surfaces, such as your bedside cabinet, you might choose a lamp with either a grey shade or base (a concrete lamp stand looks very chic in a modern grey bedroom) with candles in grey or silver vessels close by. Art and ornaments are not to be overlooked either, even in a small grey bedroom. A single contemporary ornament in grey marble or granite on a window ledge has the potential to anchor your entire scheme. Grey is a colour that goes with just about every other colour. It’s one of the most-celebrated new neutrals of our time. So when you’re thinking of a grey colour bedroom, don’t forget there’s a plethora of complimentary shades to choose from to devise a two-toned scheme. Arguably the most elegant of all the grey colour pairings. Choose pale grey and white and your bedroom will feel at once calm, bright and sophisticated. Choose dark grey and white and you’ll achieve a crisp contrast that’s just a touch softer than black and white. While grey and yellow is a colour duo made popular by the Mid-century movement, grey and orange bedrooms are of that same ‘zesty pop of colour’ school of thought, but less exuberant. Orange works with every shade of grey, but on the whole, stick to more vibrant oranges because they’re there to be noticed. Think tangerine throws or an orange velvet accent chair, or even pieces in a warm tan leather. If you’ve chosen a muted, light grey bedroom, know that one of the colours it works exceptionally well with is pale pink or lilac. Together, they share a dusky quality that’s instantly soothing and quite romantic for a bedroom setting. As a small grey bedroom idea it trumps too, because it plays on the space being cocooning and comforting. The darker the grey you have in your bedroom though and the punchier the pink or lilac, then the greater the contrast and the bolder your look will be. Most interior design articles will talk about creating contrast. This is quite right, but contrast doesn’t have to be done through colour. Grey and silver as your bedroom’s palette works because the two tones are so similar. Here it’s about subtle differences in colour combining to build serenity in your bedroom. Instead, establish contrast through different textures such as silk against velvet and mirror against wood. Of all of the colours that team nicely with grey, blue is the one of the most obvious matches. No matter which shade of grey or blue you choose, they all share the same steady, soothing qualities which makes contrast less of a focal point. Blue and grey together is a case for subtle nuances in colour. This way, you’re shedding light on the fact that your colours are connected. Picture a dark grey bedroom with a navy shade hanging from the ceiling, or a pale grey bedroom with a duck egg blue rug on the floor and curtains. In each scheme, you’re adding a new colour ingredient, but one that enhances the overall flavour. Grey and yellow are two shades that work in real harmony. The ying to the other’s yang. A calming grey tones down the vivacity of sunny yellow which is what makes a grey and mustard bedroom score highly. Dove grey and primrose yellow are uplifting and happy, suiting a child’s bedroom. And charcoal grey and daring acid or chartreuse are colour duos that are more contemporary and outspoken. A single yellow design in a grey bedroom will accent your scheme, or add in a few elements of yellow such as curtains, slipper chairs and a throw pillow or two to up the ratio between your grey and yellow split. Pale teal makes an excellent accompaniment to light grey. It’s a less common colour scheme, so it has something about it that’s unexpected and new but, together, they look at ease with one another and are a prime example of bedroom sophistication. Brass or copper along with apricot are other tones to feature in this grey colour scheme too. For inspiration on using grey in your living room, take a look at our grey lounge colour schemes feature.